Happy Wednesday! 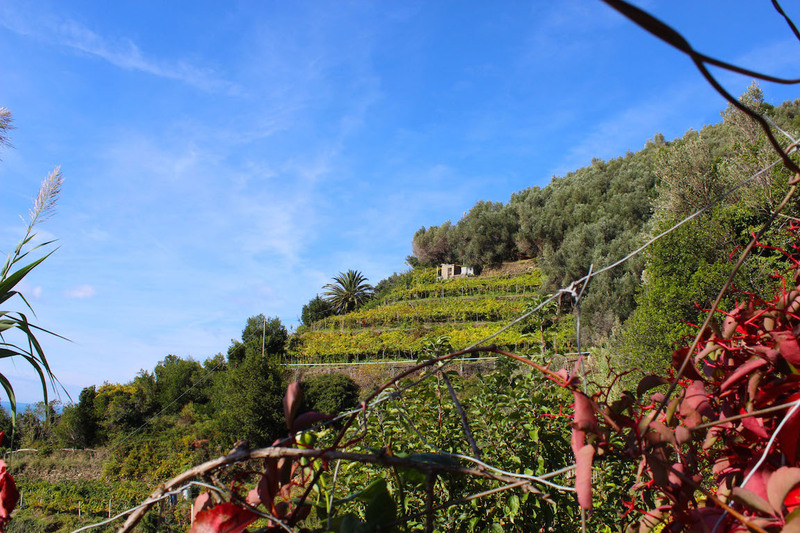 I have another Italy installment for you, which is rather timely, as I just spent the evening cooking a massive Italian feast for friends. 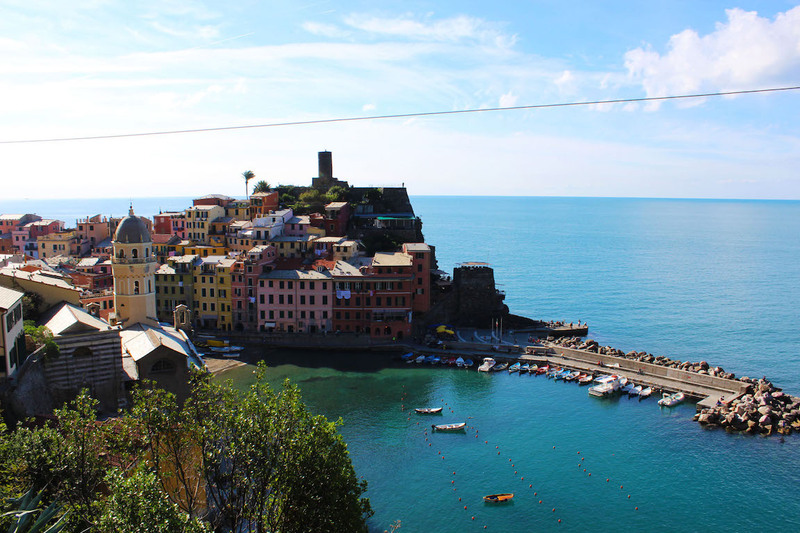 I really miss Italy. 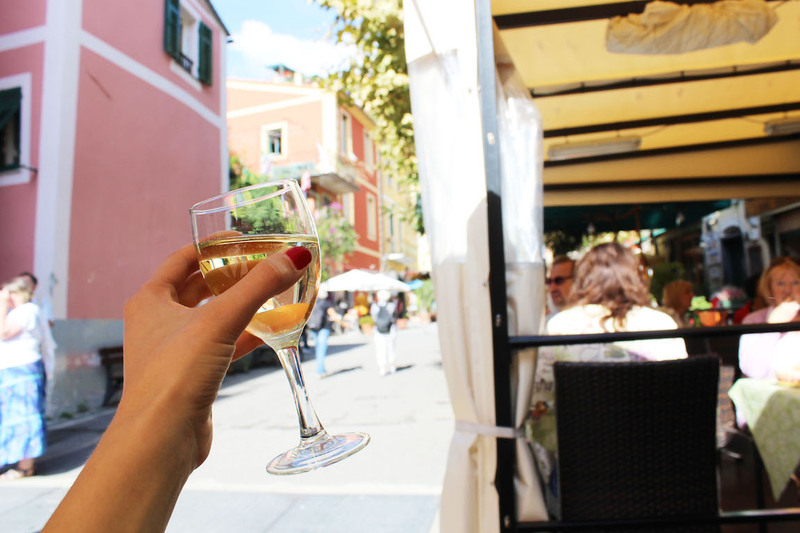 The sunshine, the wine, the pastel-colored villages, and above all, the rich and flavorful cuisine. 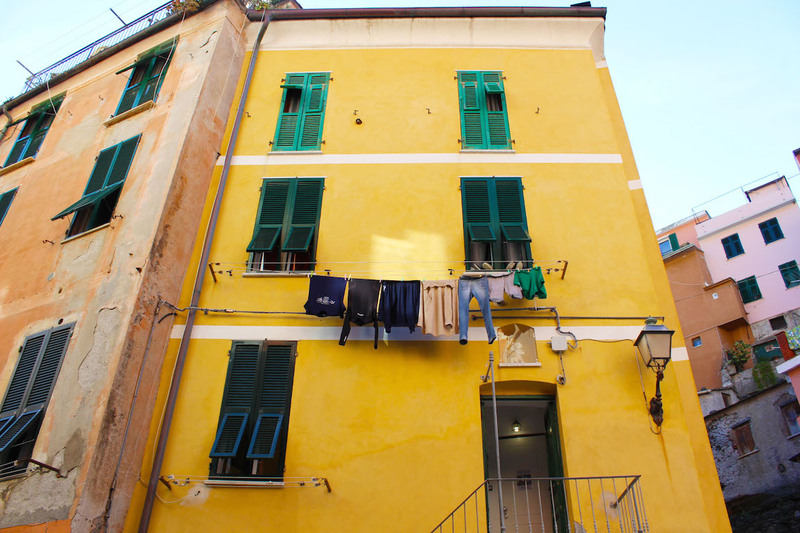 Luckily, I own a pasta machine, and can *try* to re-create some of Italy’s finest fare in my own kitchen. Tonight I whipped up an Italian storm, rolling out fresh linguini, homemade pesto, warm prosciutto with herbs, and a light caprese salad. 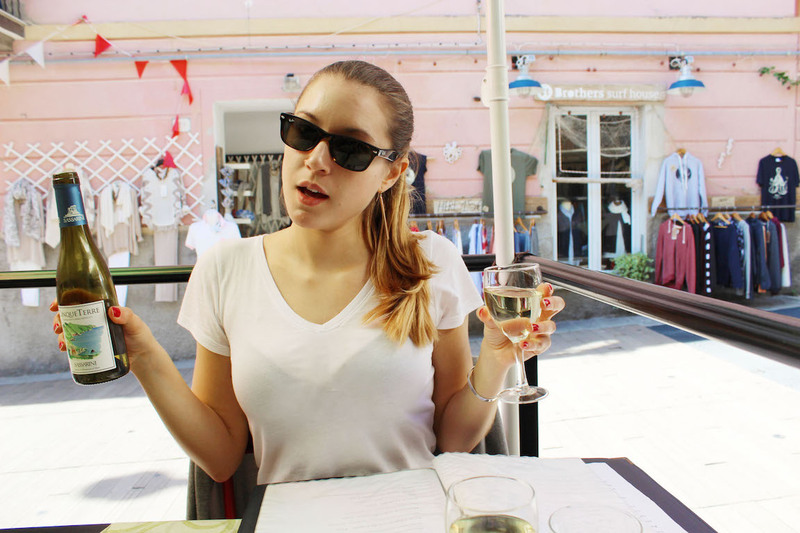 I’m currently feeling pasta-drunk – that post-carb haze that smothers your eyes and soul after a fantastic meal with good company, fresh pasta, and copious amounts of wine. 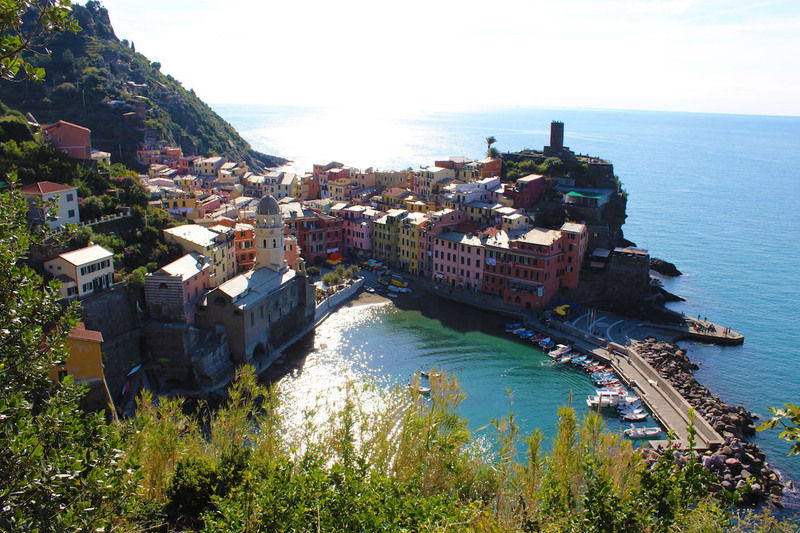 But enough about tonight – let’s chat Cinque Terre! 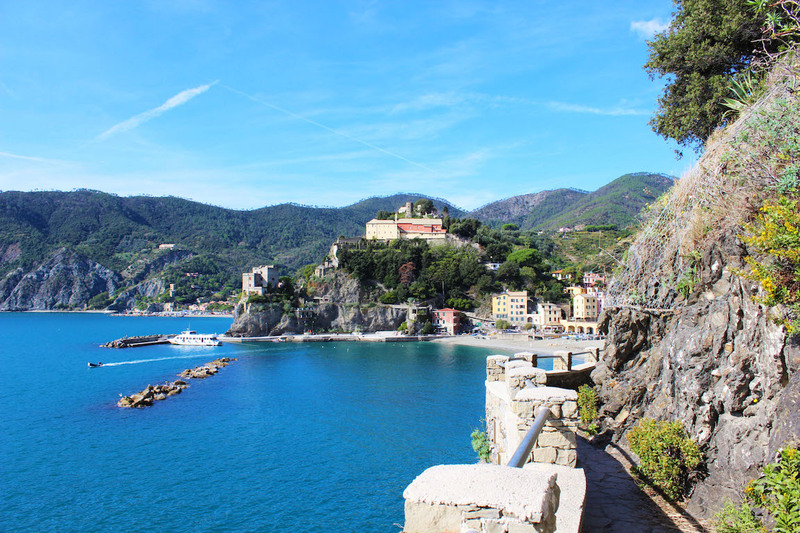 There are five stunning villages in Cinque Terre, and as Amie and I explored Vernazza on our first day in Italy, day number two involved a breathtaking hike in the sunshine to the most northern village, Monterosso al Mare. 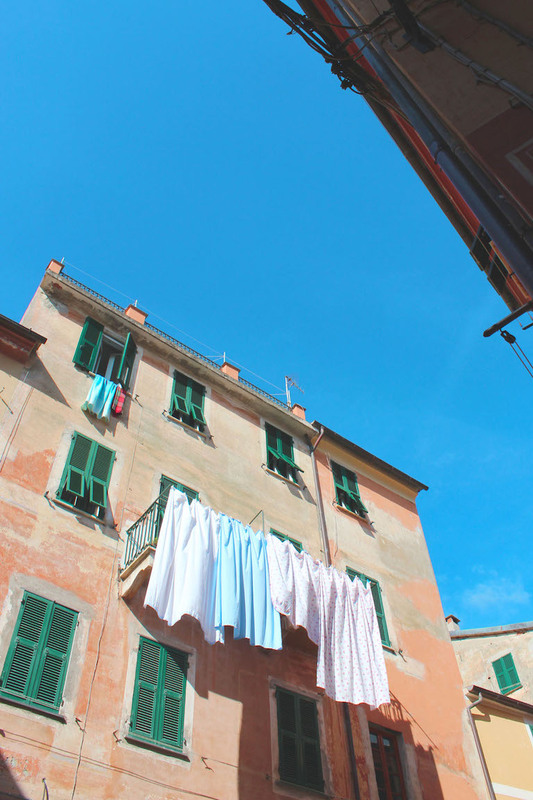 But before we get to Monterosso al Mare, let me tell you about our morning routine in Vernazza. 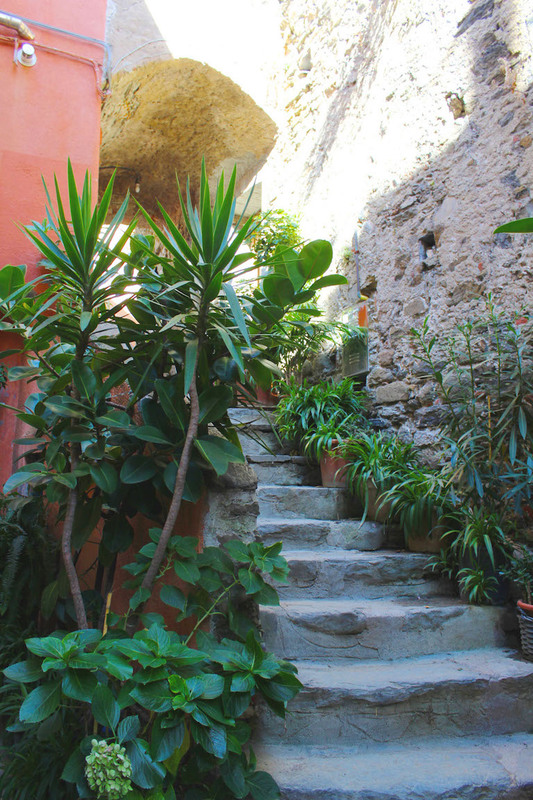 As mentioned earlier, our Airbnb in Vernazza lacked internet and cell phone reception. 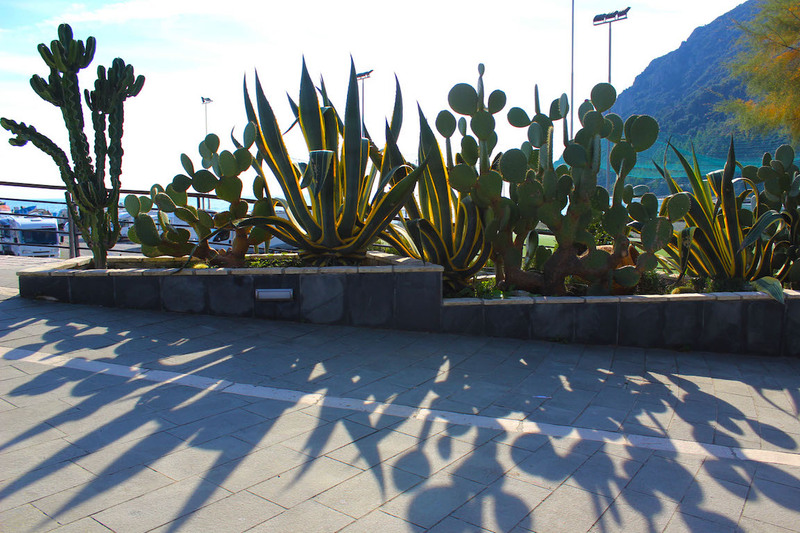 And so every morning, Amie and I would venture out into the sun, in search of wifi and caffeine. 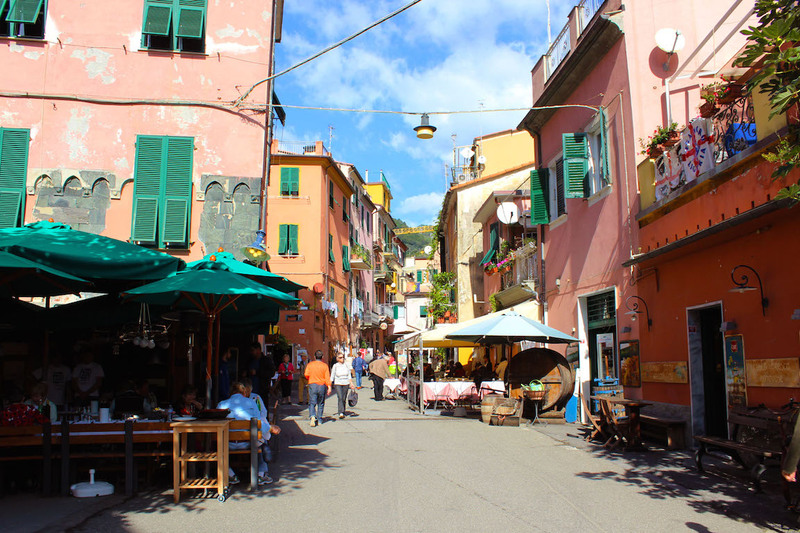 Vernazza is adorable in the morning light, and is especially lively on a Tuesday, when a small market is set up along the main road. 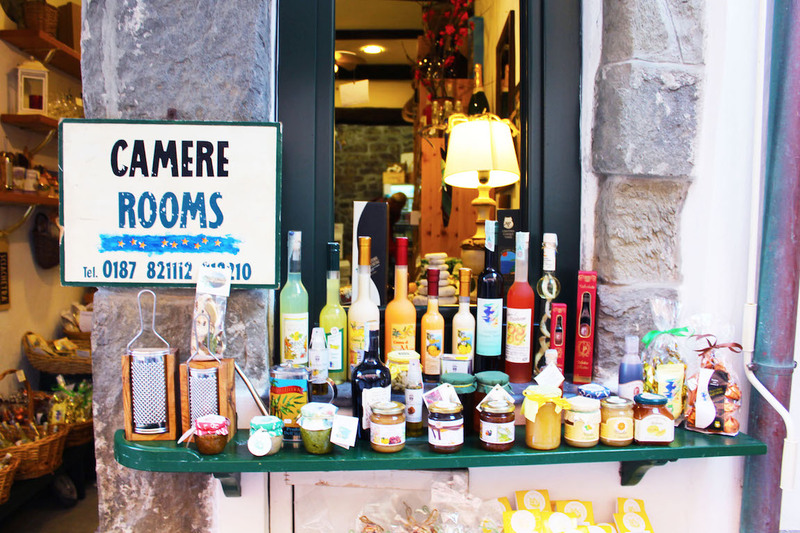 Figs, clementines, olives, farm fresh vegetables, and an assortment of breads and cheeses are sold from small trucks and tents, serving as light picnic snacks or scrumptious ingredients for dinner. 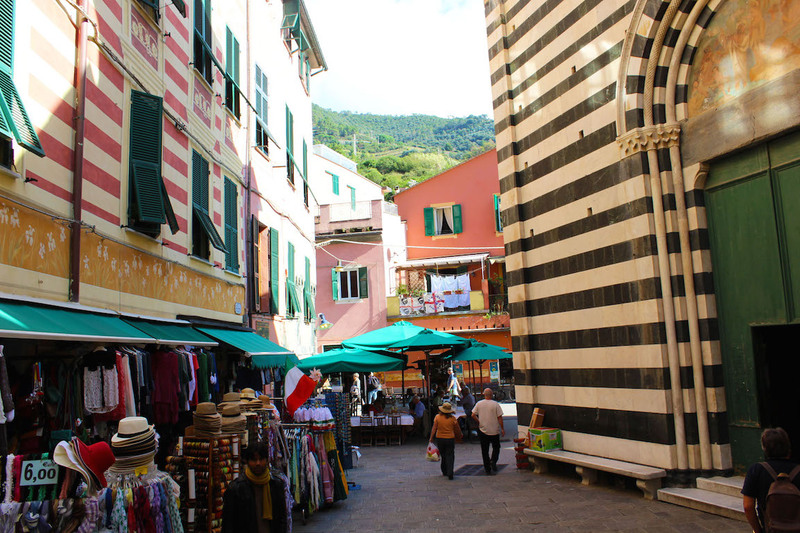 Life in Vernazza is slow, and the market adds a small jolt of excitement in the village center every Tuesday morning. 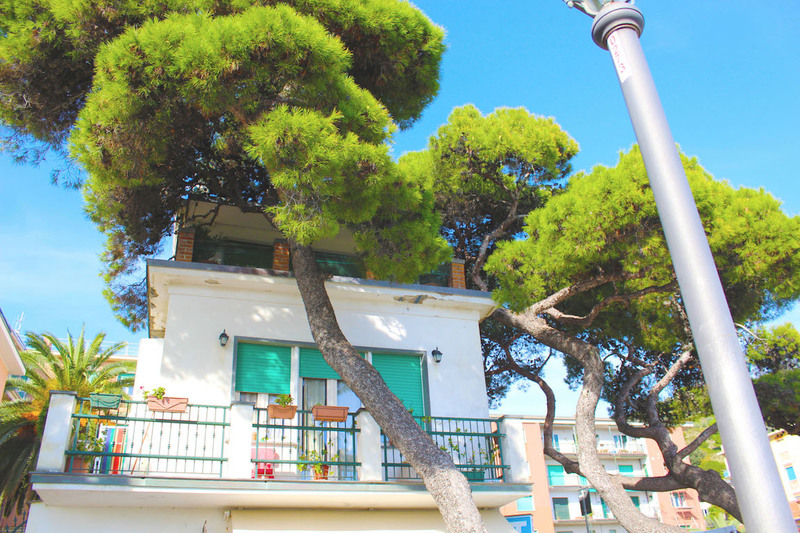 And of course, you will also find an assortment of tourist shops selling dried pasta, locally pressed olive oil, lemon products, homemade pestos, and wine, all of which are abundant in the region. 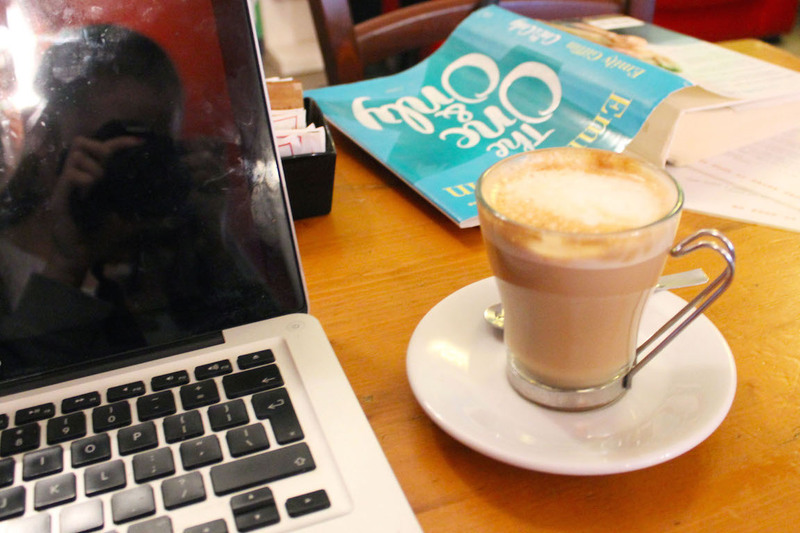 Typically, Amie and I would start each day at The Blue Marlin Cafe, drinking caffelattes, checking our e-mails, and eating small pastries for breakfast. 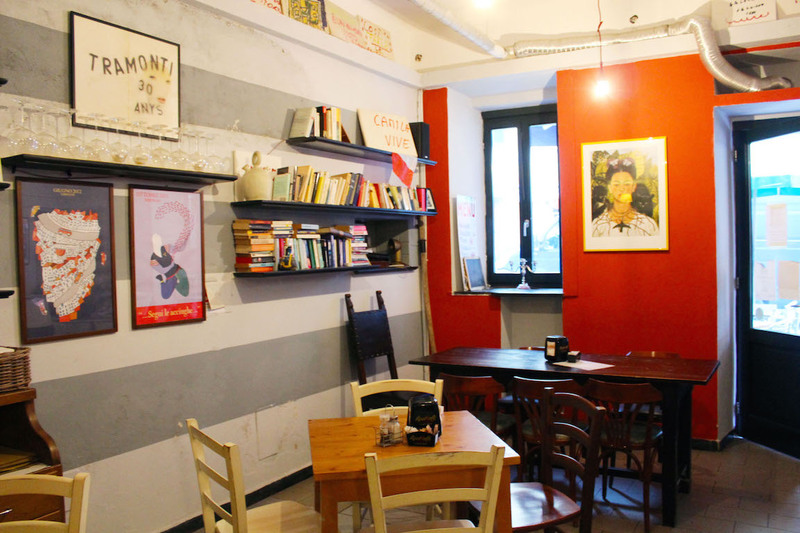 The Blue Marlin Cafe was adorable, with a small library, free wifi, and an interesting assortment of music (I swear we listened to Queen for 2 hours one morning). And ohh gosh, my dirty monitor in the photo below . . . *cringe* After breakfast we would make a few stops in town, picking up snacks for our hikes, big bottles of water, and anything else we needed for the day (aka wine). 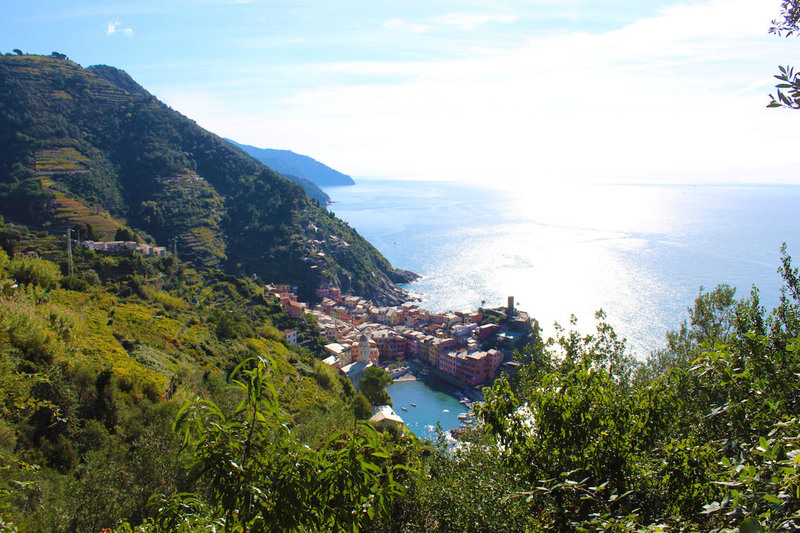 On this day, Amie and I decided to hike from Vernazza to Monterosso al Mare. 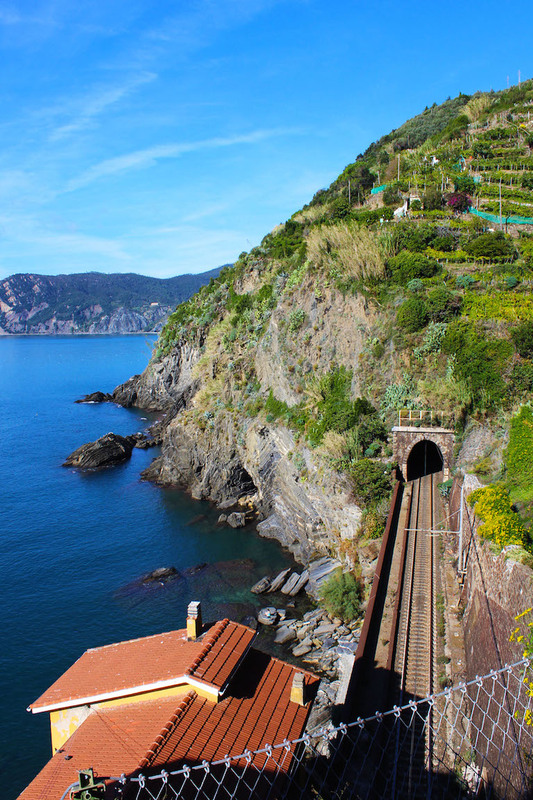 Cinque Terre is connected via trains and hiking paths, and is not easily accessible by car. 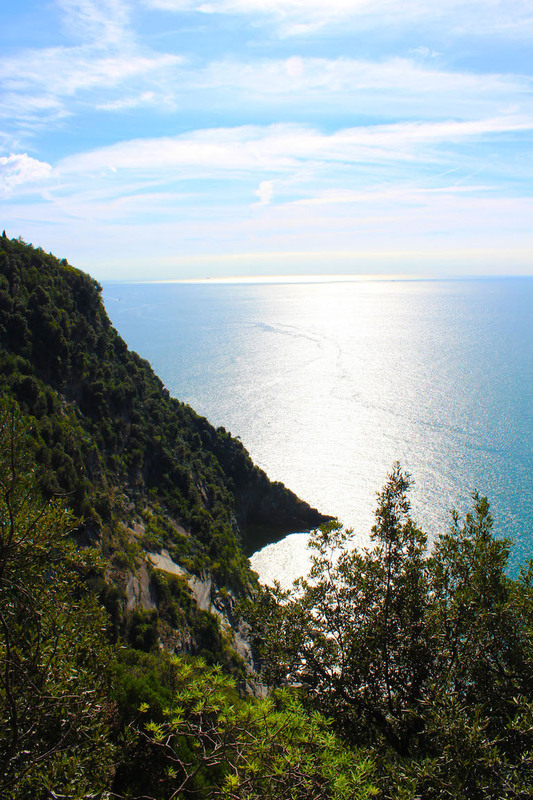 The hiking paths range in length and difficulty, with seaside trails offering scenic views for leisurely hikers, and mountainous paths for more experienced outdoorsmen. 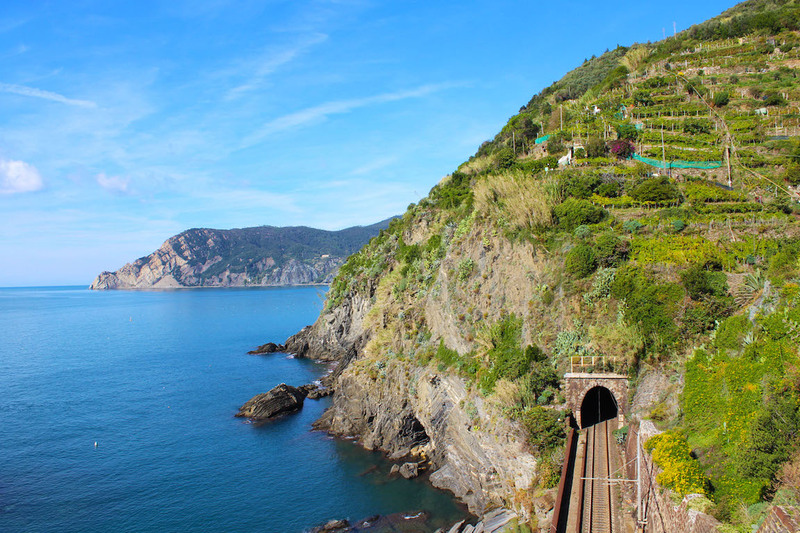 The Blue Path is the most famous trail, as it connects all five villages in Cinque Terre. 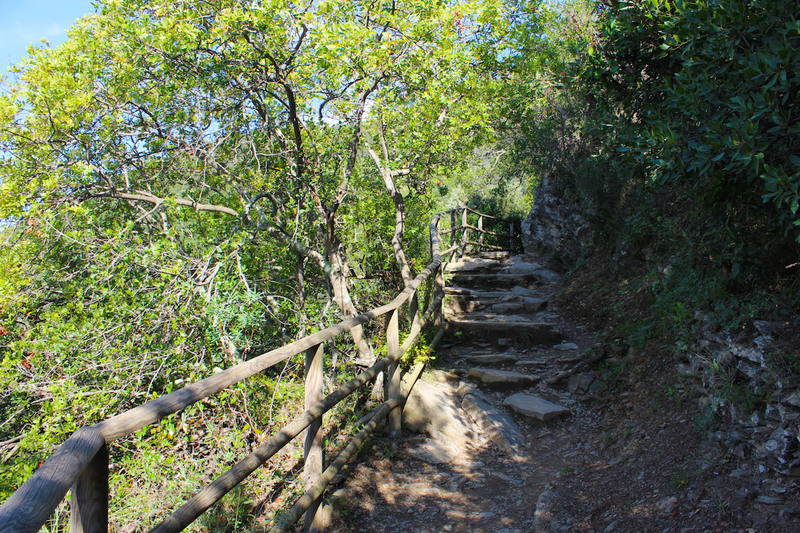 It’s one of the easiest paths to hike in Cinque Terre, and is by far the most popular. 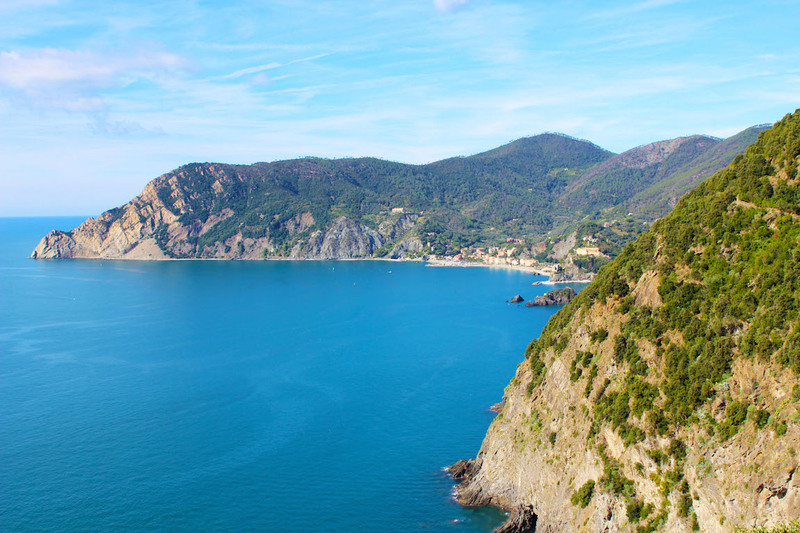 The hike from Vernazza to Monterosso al Mare is the most northern trail along the Blue Path, and it is also the most difficult. 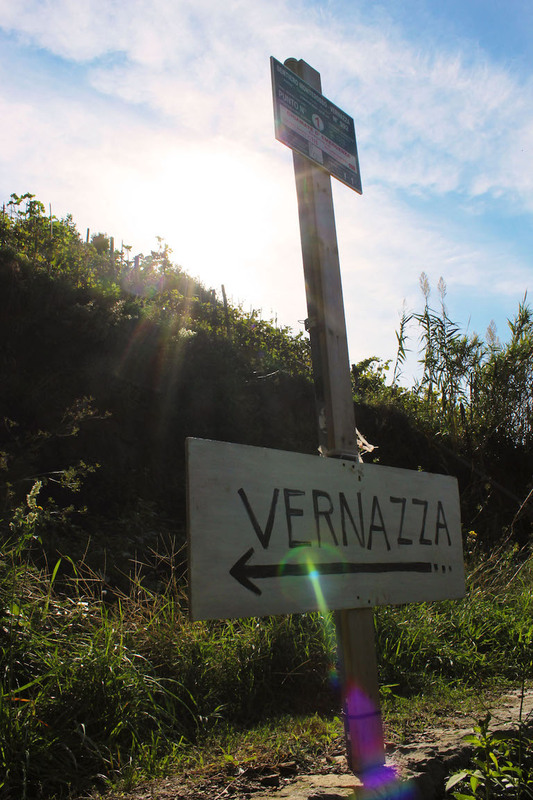 The hike takes around two hours, and requires climbing up and over many tiring slops. The last hike I completed was to Kjeragbolten in Norway, and I must say, the difficulty of the Blue Path paled in comparison. 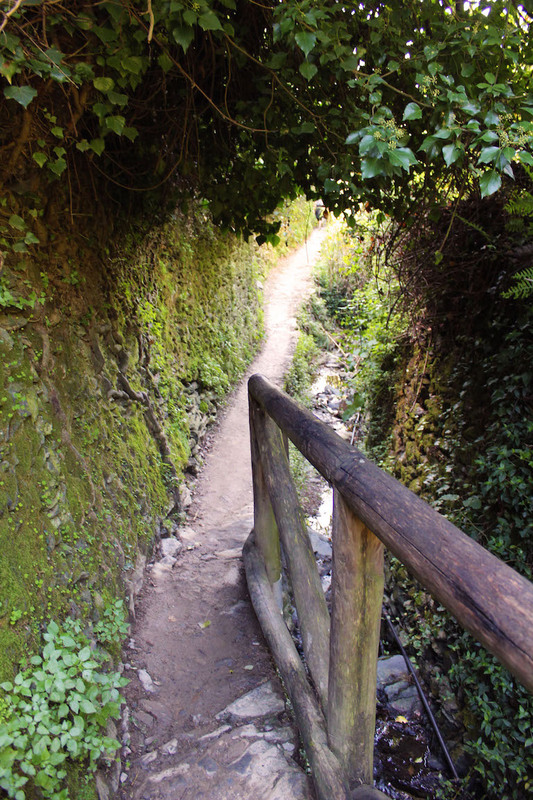 However, for inexperienced hikers, the trail could prove slightly more difficult. 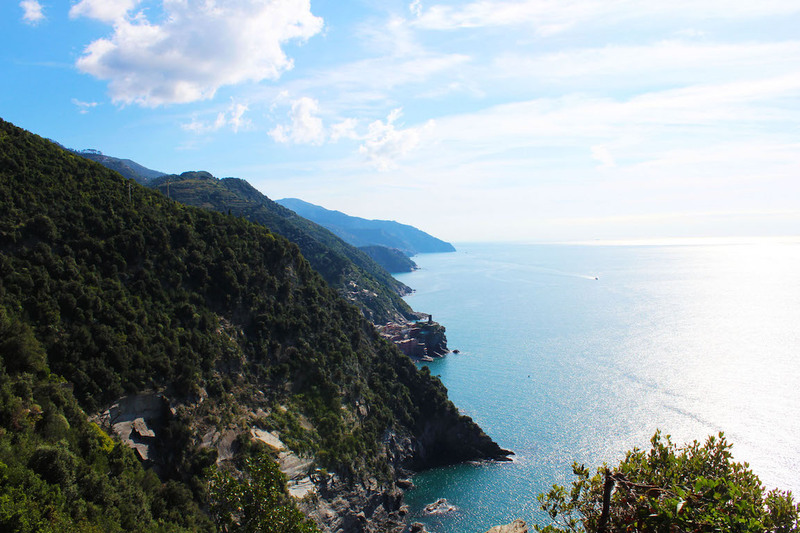 That said, there were ample opportunities for rest, as the views from the mountainside were astounding. 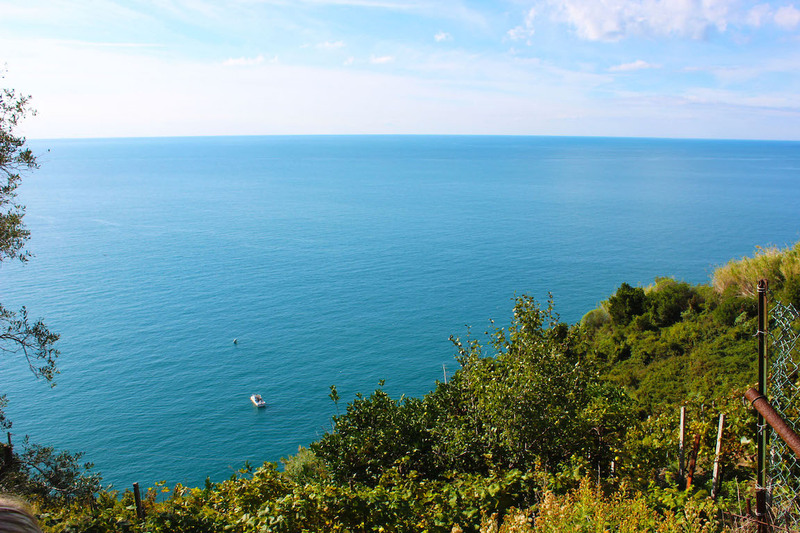 We stopped every 10 minutes or so to gaze out at the sea, snap photos, and fuel up on water. 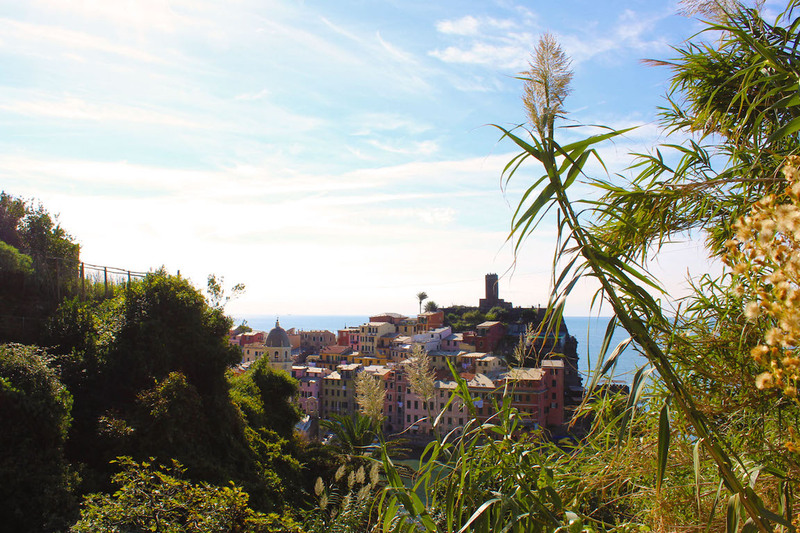 The hike literally scaled the mountainside, offering stunning views of the sea, the horizon, and the small village of Vernazza which slowly disappeared below us. ^ ^ Amie takes a little break. 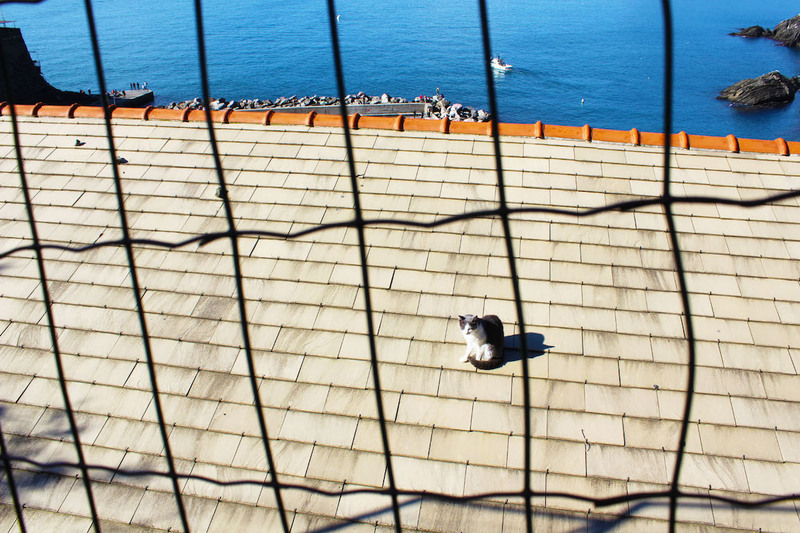 I have to say, she was an absolute trooper in Italy. 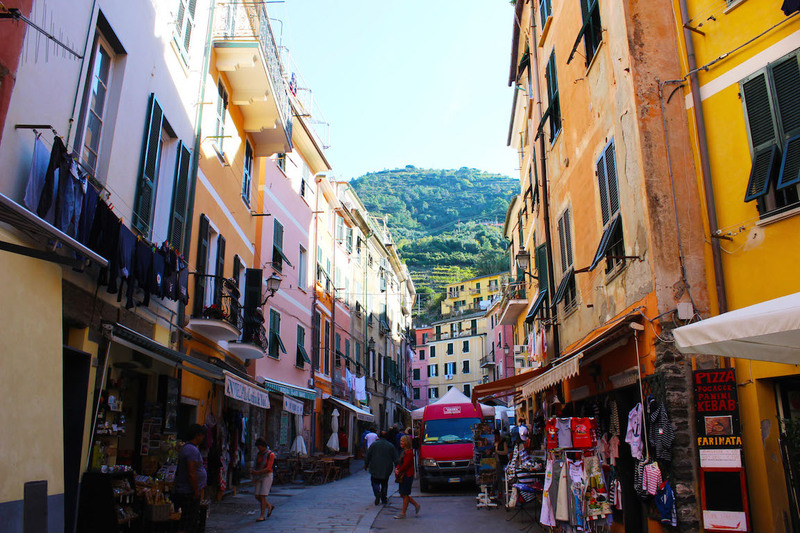 She came down with a nasty cold on our first day in Vernazza, but still managed to lug herself up mountainsides and along the Italian Rivera. 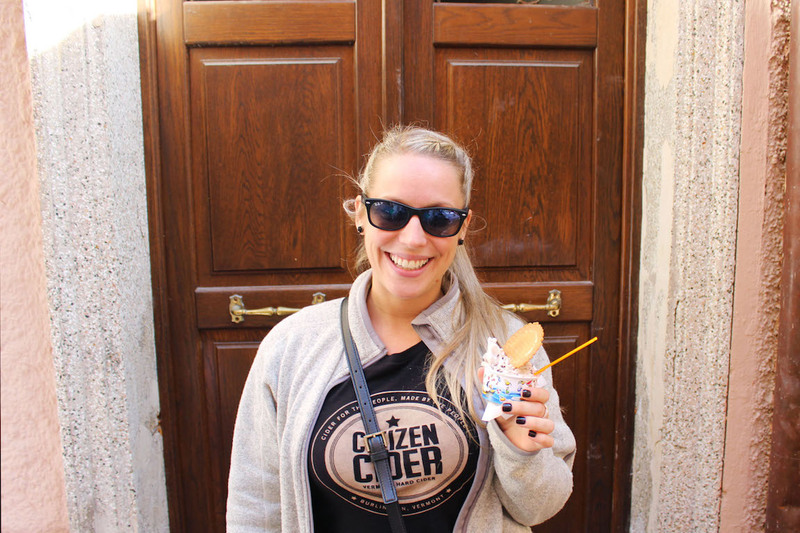 I’m a total whimp when it comes to being sick, so I applaud Amie’s willingness to still explore and experience Italy, sick bug and all. 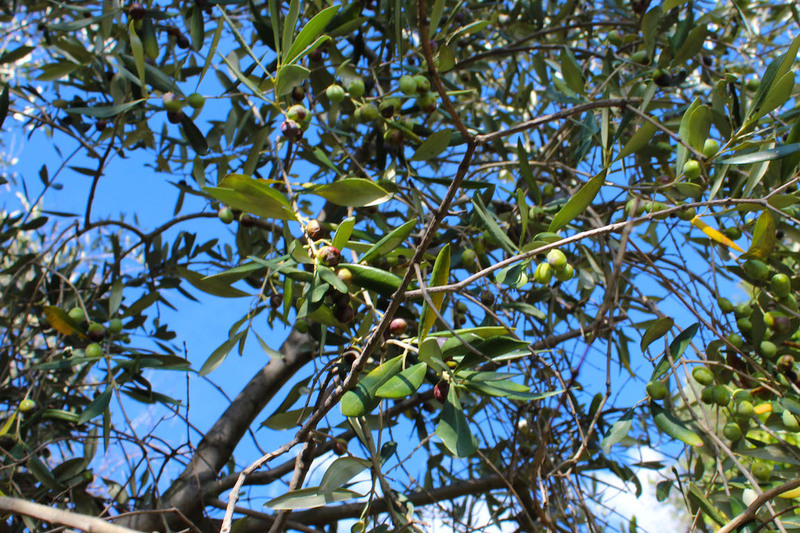 v v Olive trees! 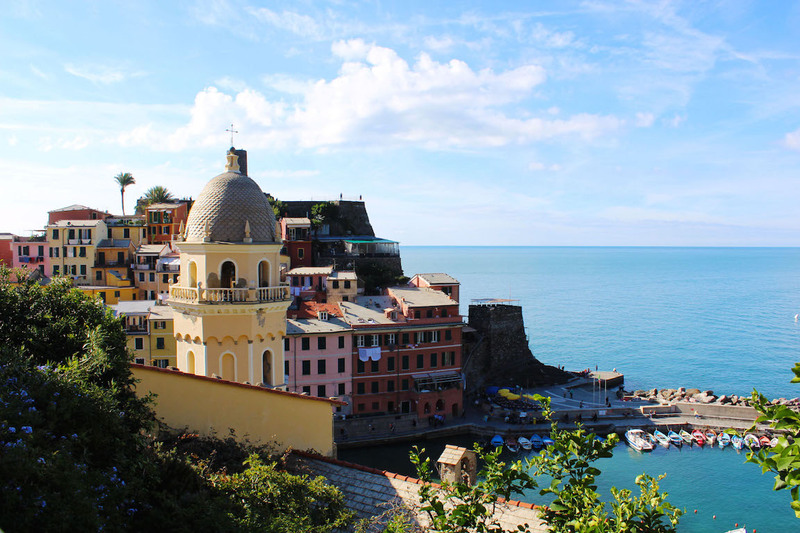 Soon, Vernazza became a small toy village, and eventually disappeared from sight. 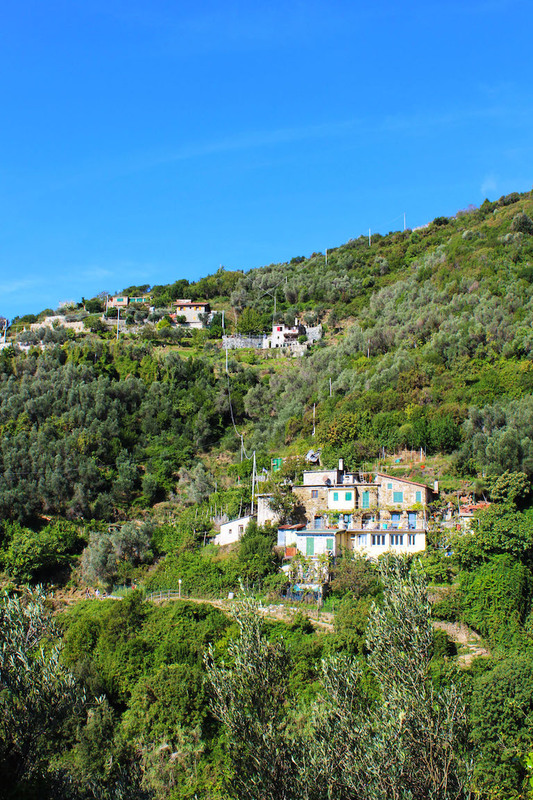 Which was fine, because the turquoise waters, rocky mountainsides, and leafy olive trees painted new and equally scenic picture (this is where I have to apologize for the twelve-million sea / mountain / tree photos – eek sorry!) 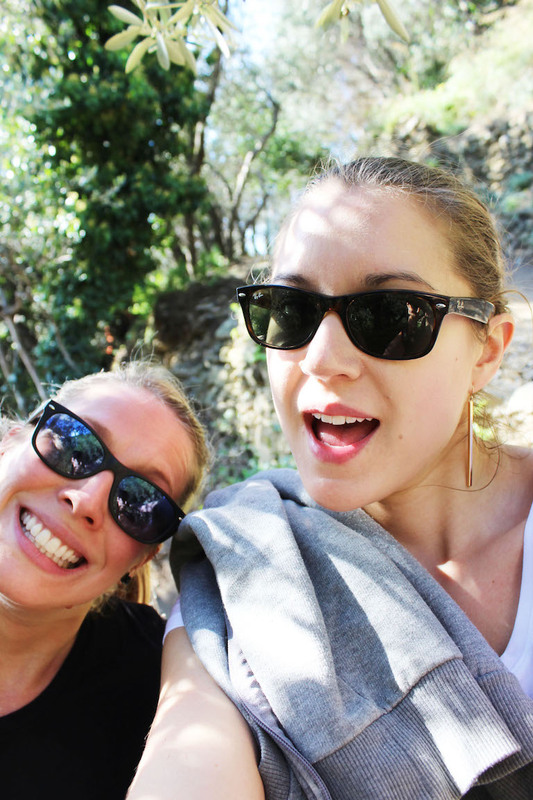 ^ ^ Friendship hiking selfie! 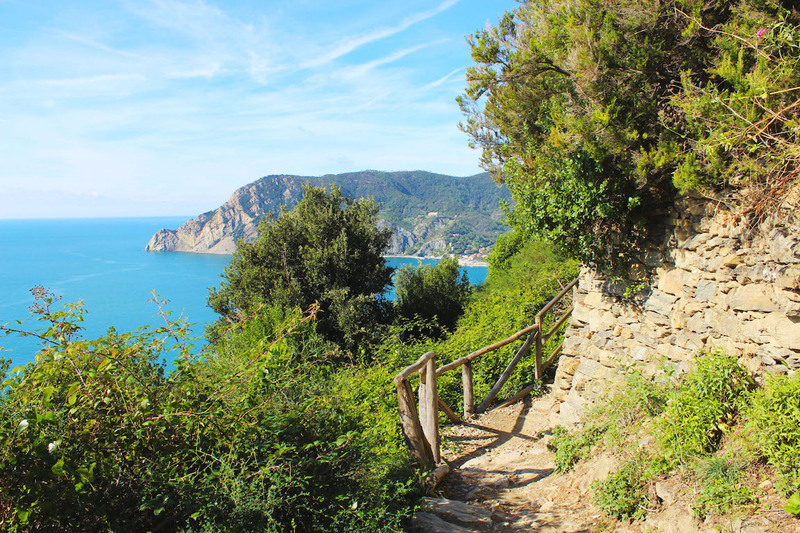 After hiking for about an hour, we finally reached a curve in the path where our view was directed north, towards Monterosso al Mare. 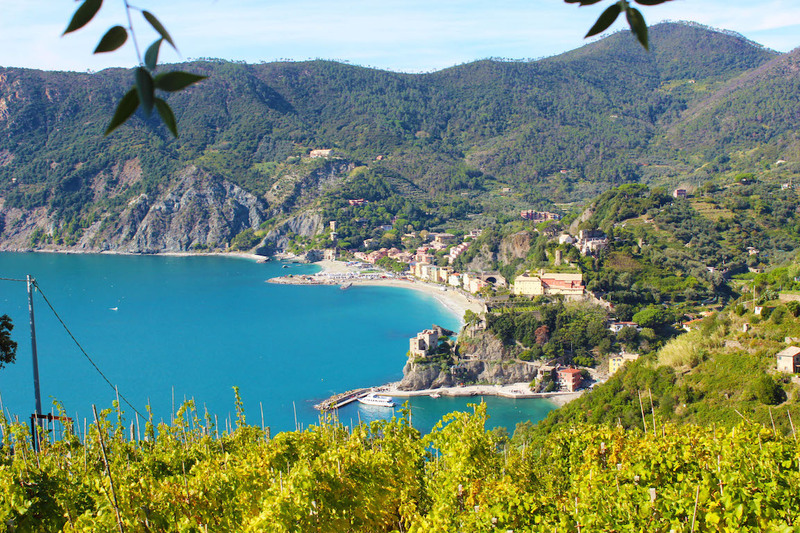 We could see the small, seaside village far, far off in the distance. 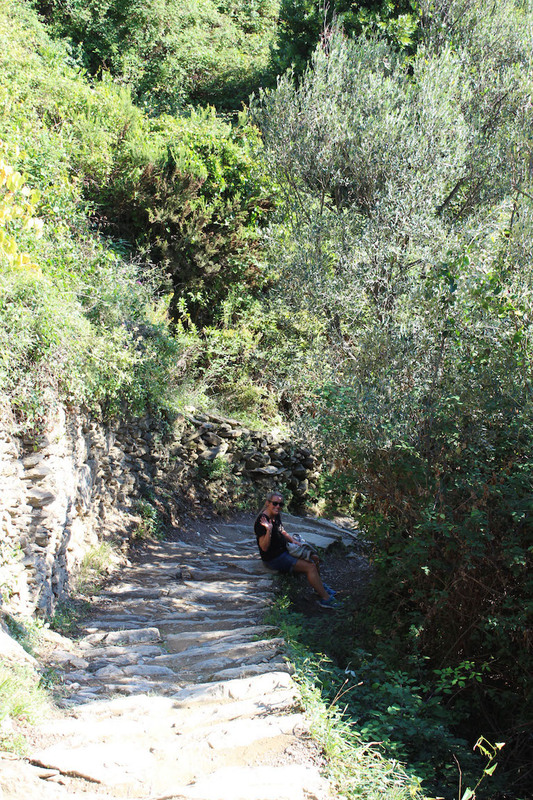 And so we continued our hike, stopping only once . 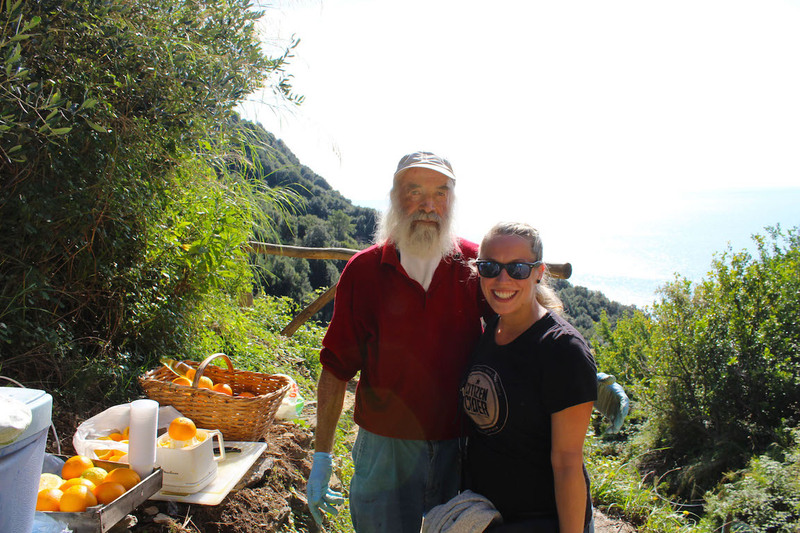 . . . . . . for some fresh squeezed orange juice from this Italian Santa v v From here we descended quickly, reaching Monterosso al Mare in about 15 minutes. 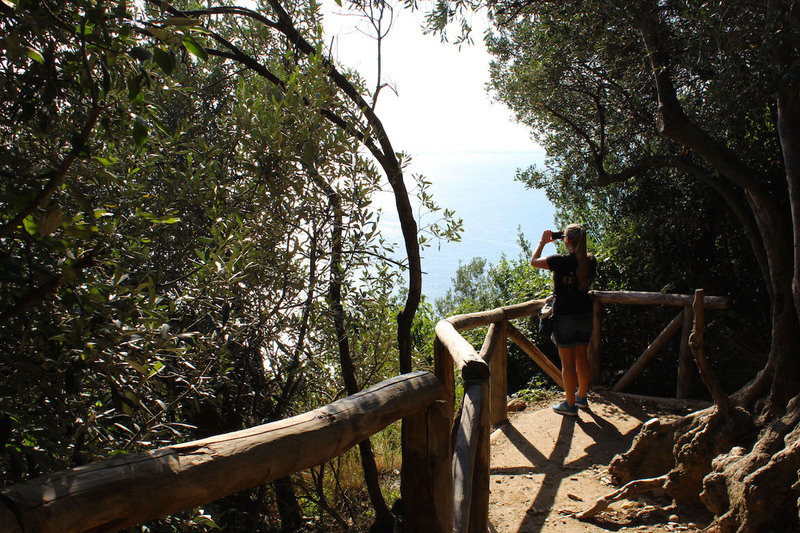 Overall, it was a lovely two hour hike, and my only regret was being silly enough to lug a sweatshirt along on the journey. 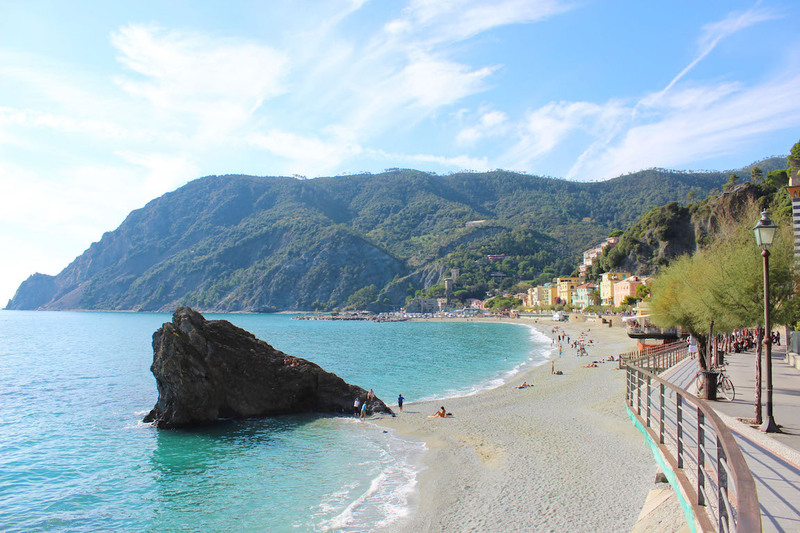 The sun was brilliant, and our bare shoulders gluttonously lapped up the warm vitamin D. We scaled along a small stone pathway, and soon found ourselves down on the beach in Monterosso al Mare. 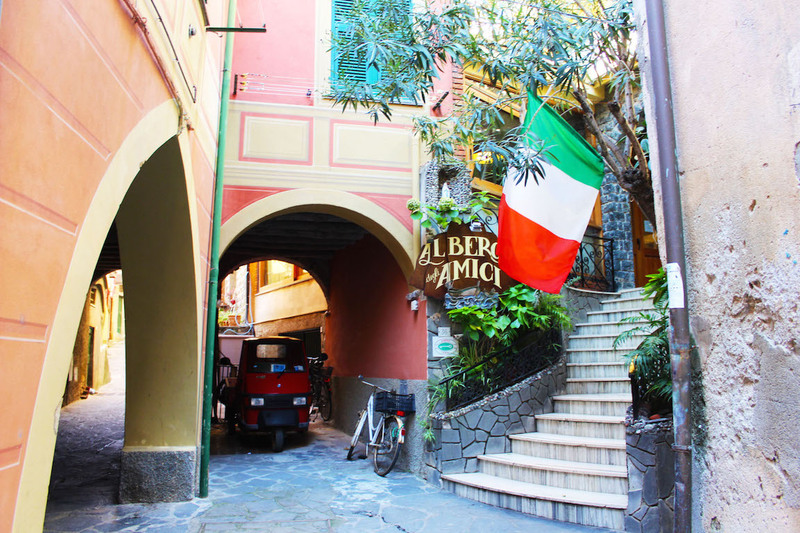 Monterosso al Mare is the most resort-like town in Cinque Terre. 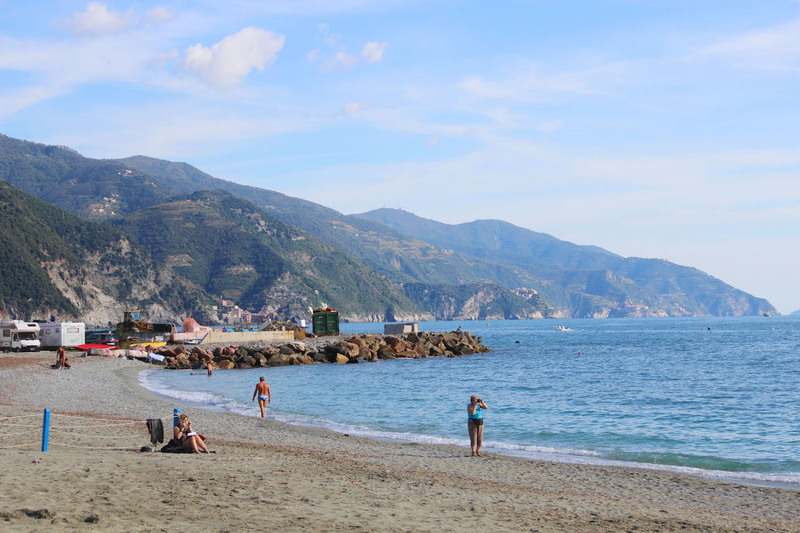 There is a lovely sand beach that runs along the coastline, beaconing locals and tourists alike to lounge in the sun and dip their toes in the sea. 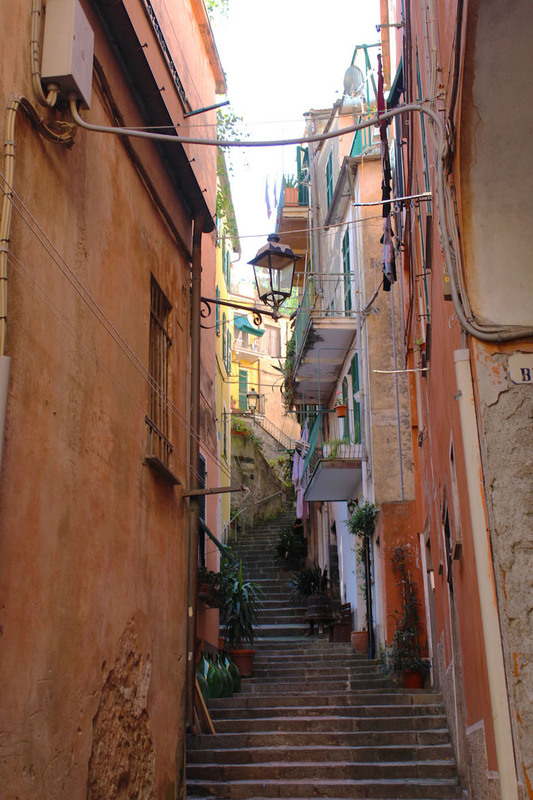 Monterosso al Mare is divided into two parts, the old town (below) and the new town. 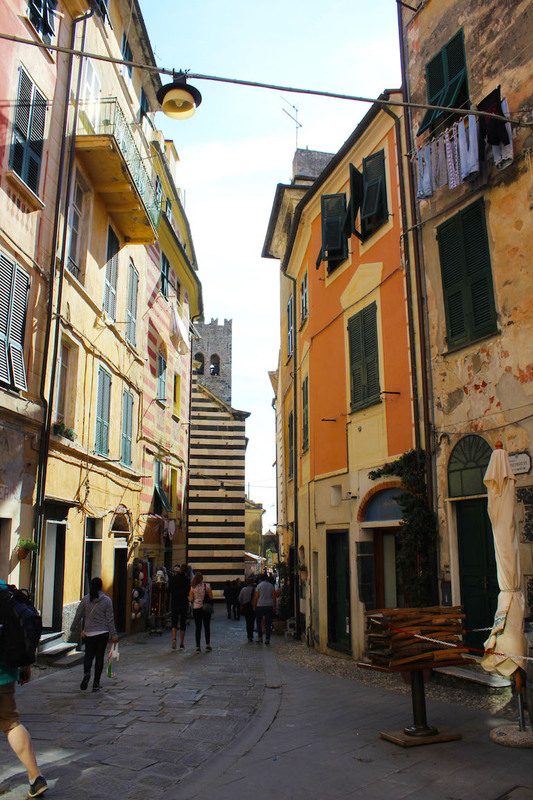 The old town feels very much like Vernazza, with narrow, winding alleyways and an assortment of colorful houses (of course, all with green shutters). 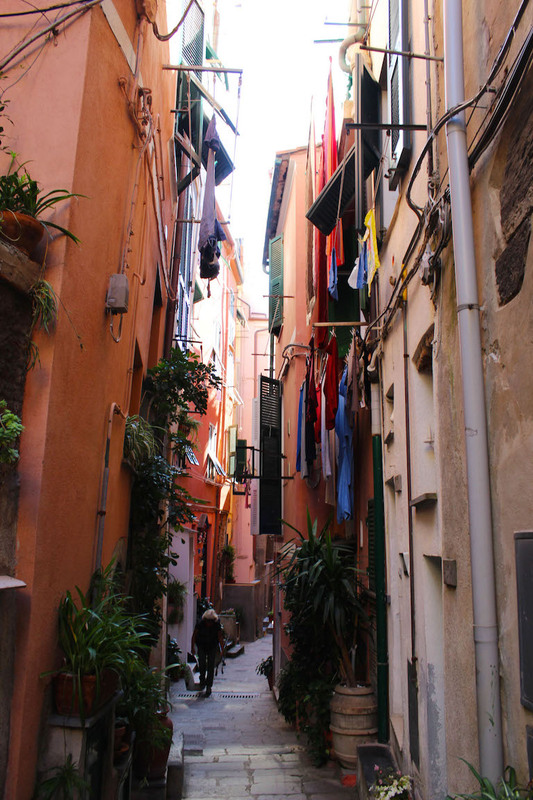 Although we were quite ravenous, we did a bit of wandering through the old town before enjoying a lazy lunch. 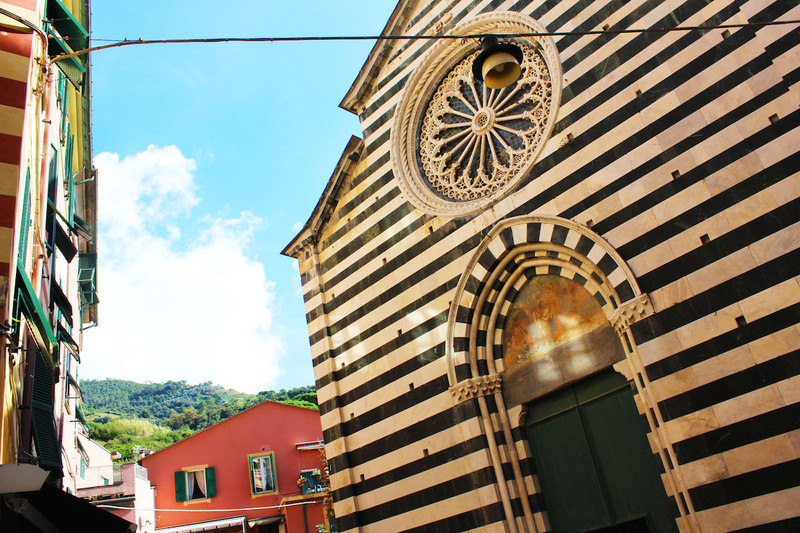 We made a quick pop in the Chiesa di San Giovanni Battista (or in English, the Church of St John Baptist) one of the architectural highlights in Monterosso al Mare. 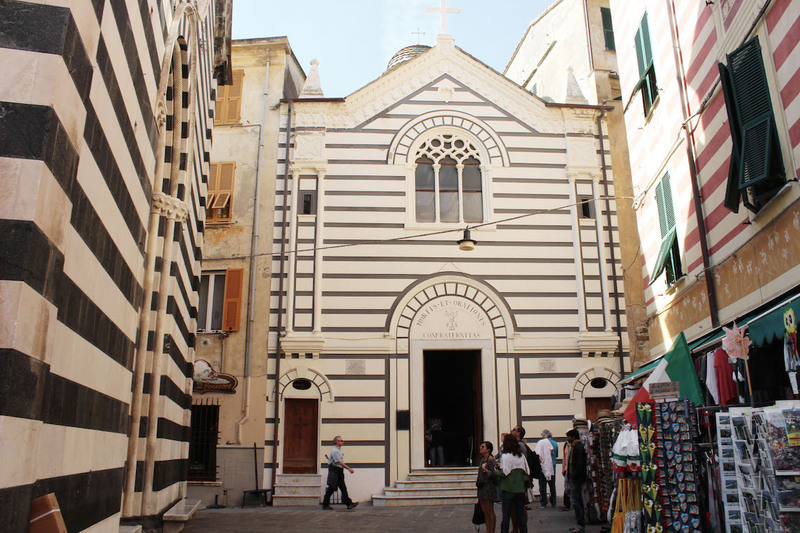 The church was built between the 13th and 14th century, and features a unique two-tone white and black facade. 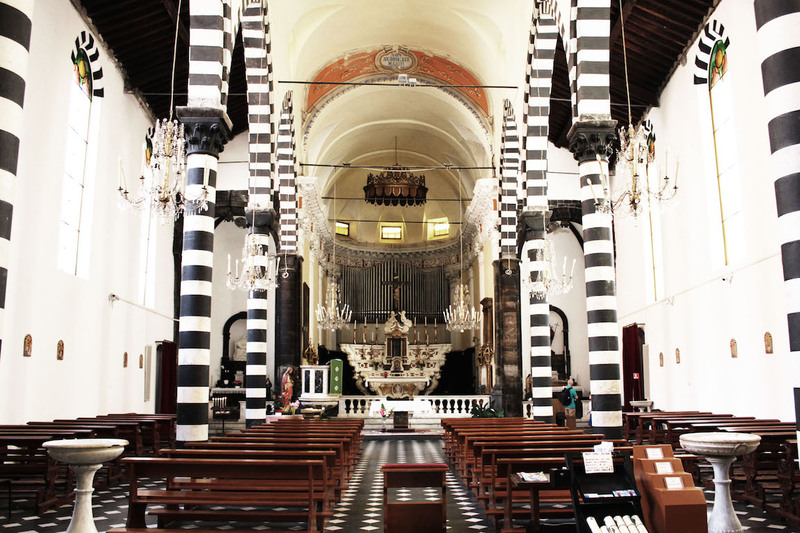 The inside of the church is similarly simple and striking. 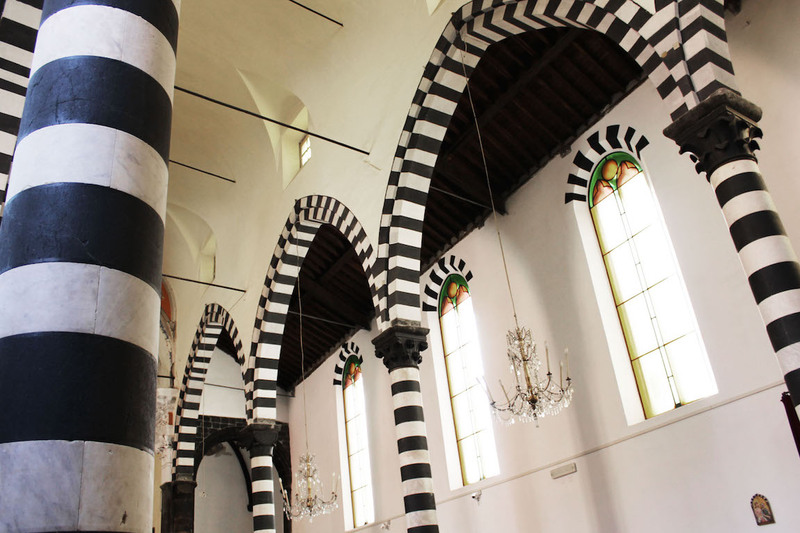 The black and white checkered floors, the clean white walls, the dark mahogany pews, and the stripped pillars made the interior of the church fell like a beautiful hipster house of worship (literally, if Sid Lee were a religious building, this would be it). I have never seen a more unique and stunning church. 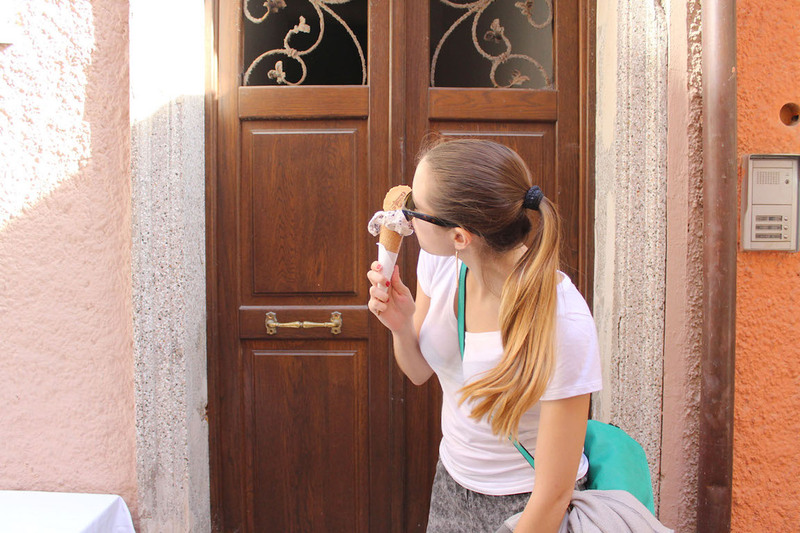 With gelato on the brain, we roamed back towards the main road in the old town. 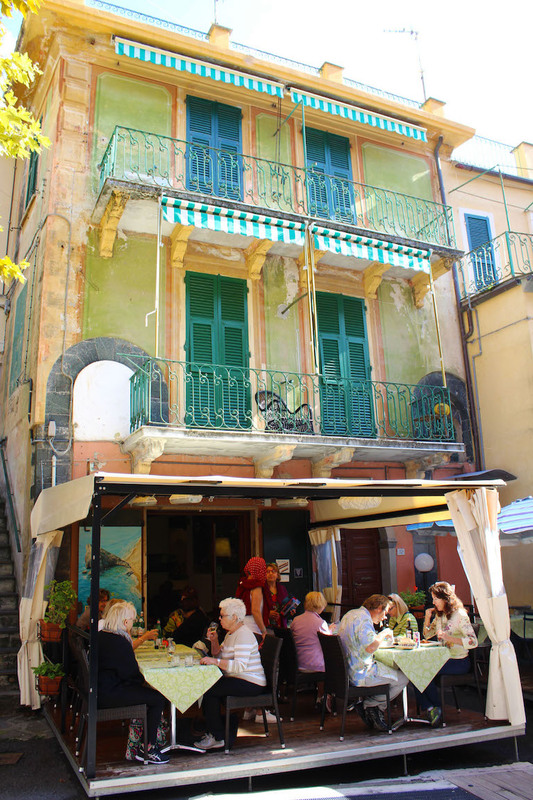 We snacked on cool melon with prosciutto, and then had a carb feast when our mains arrived. Amie, smitten by the region’s finest dish, sprung again for the trofie with pesto. 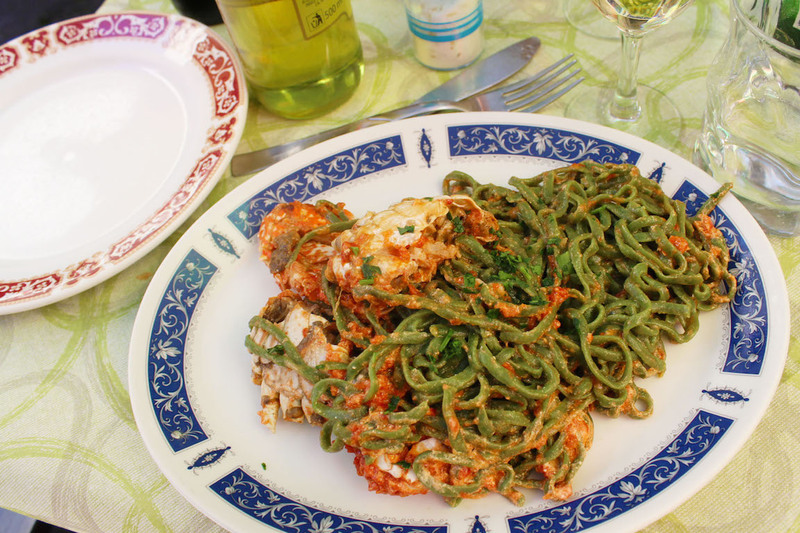 I went for the handmade green pasta with crab. It was delicious, however, by the end of the meal my fingers were covered in tomato sauce and herbs, as I took the crab de-shelling business very seriously. Oerwhelmed-pasta face! v v After our food, we did what most Americans would do and found more food . . . . . . in the form of soft and creamy gelato. 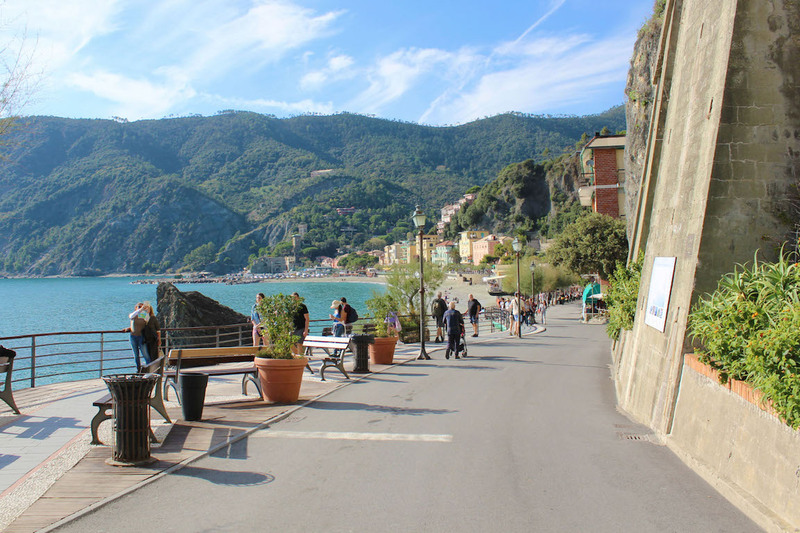 We stumbled into Gelateria Golosone to pick up some cones, unknowing that they were rated one of the top gelato shops in Cinque Terre! 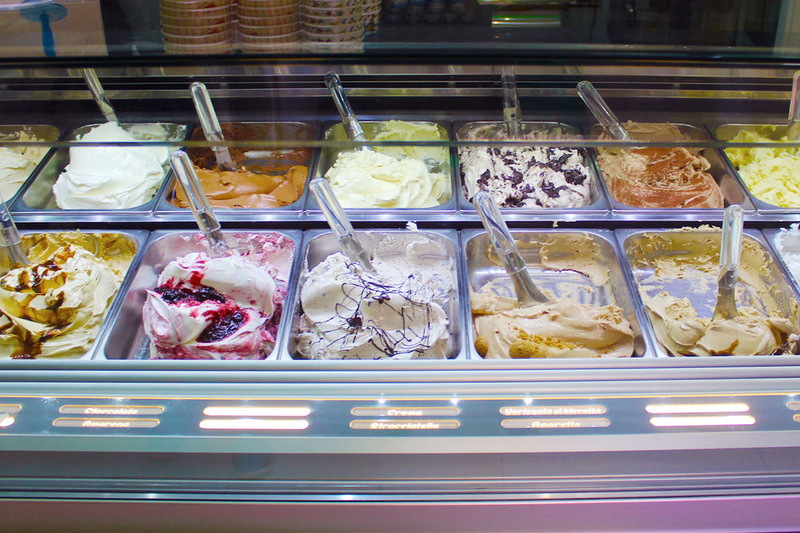 I sprung for the pannacotta, and Amie went for fruity flavors. 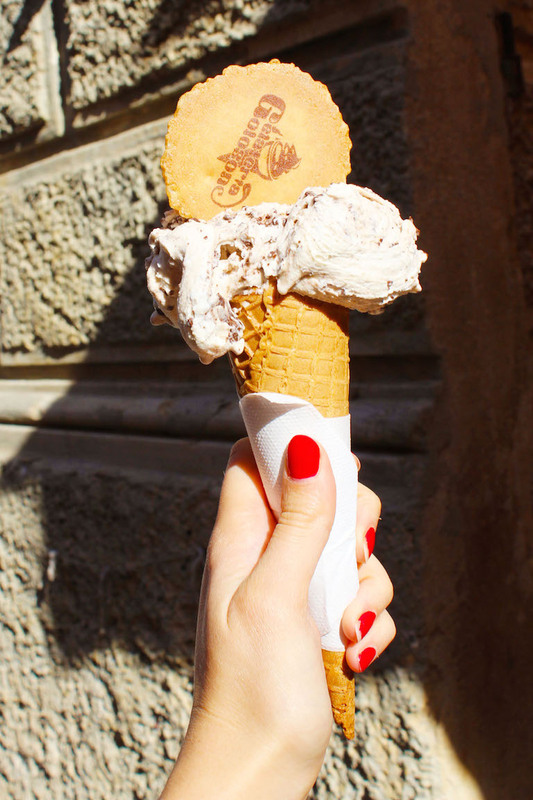 Gelato in hand, we strolled down to the sea. 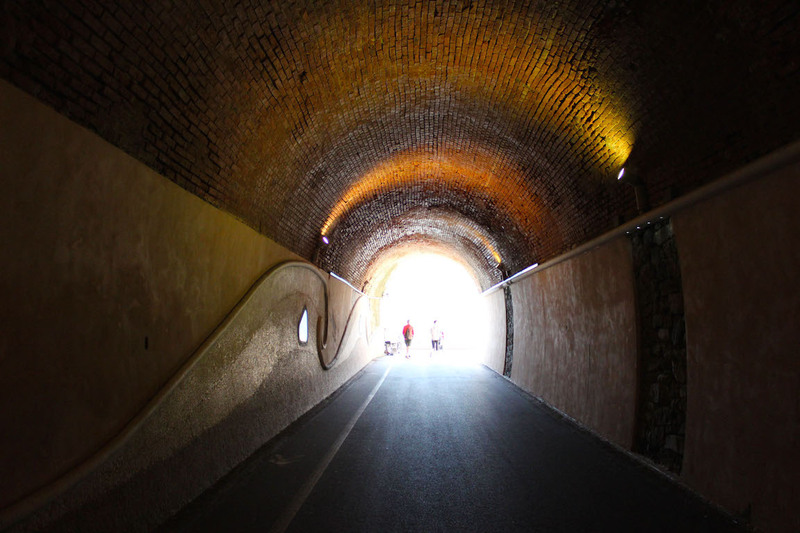 The intention was to enjoy our cones by the water, but as we walked, we heard music, and found ourselves following the melodic tunes through a long, echoing tunnel. 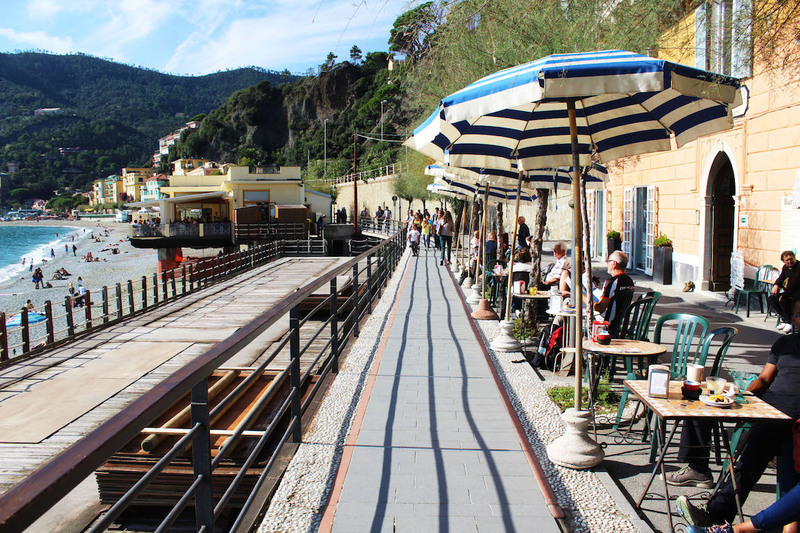 We emerged in the ‘new town’, the resort-like side of Monterosso al Mare. 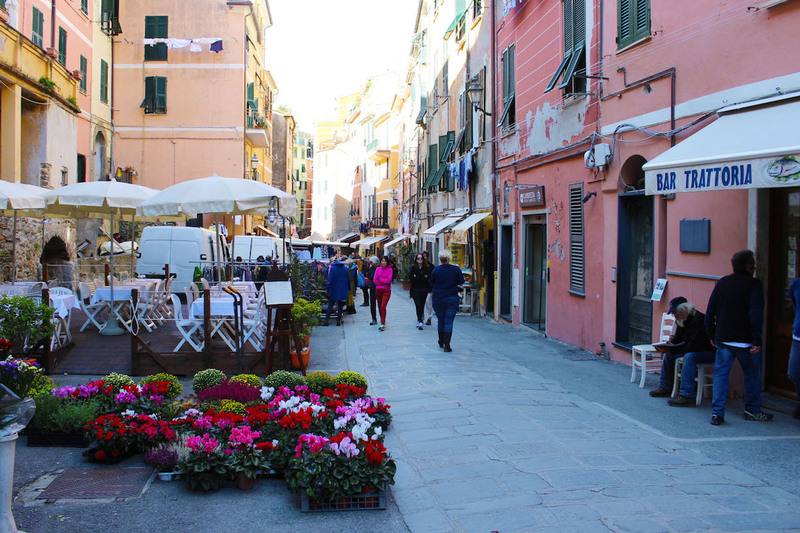 Here, tables and umbrellas lined a busy pedestrian promenade. The houses here were bigger, newer, and as Amie put it, very Florida-esque. 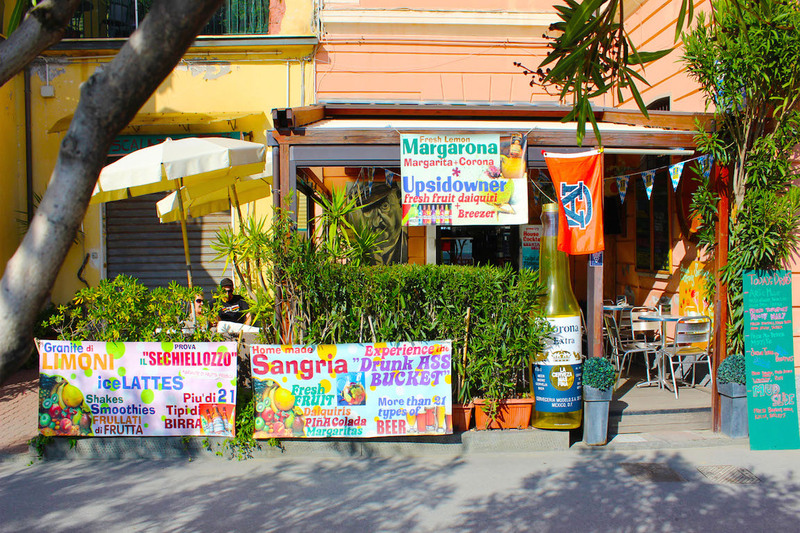 As sangria junkies, Amie and I both agreed that Monterosso al Mare was quite our style. 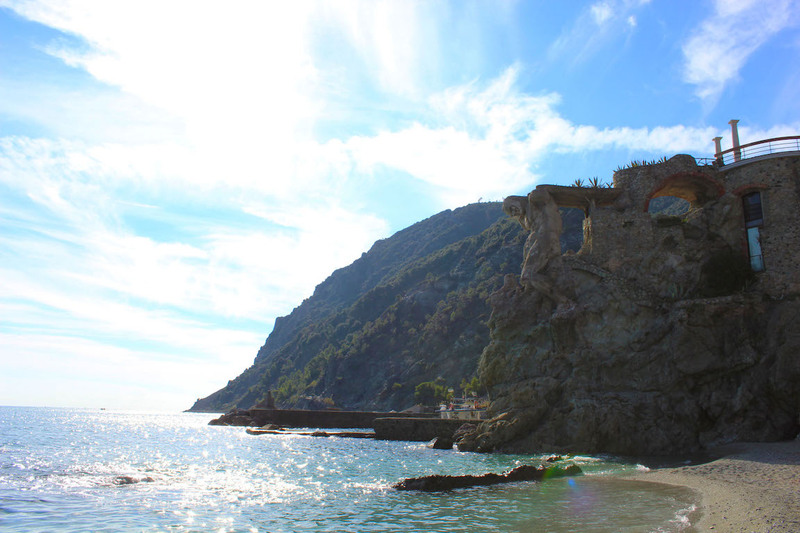 At the end of the beach, we noticed a beautiful stone giant carved in the rocks. 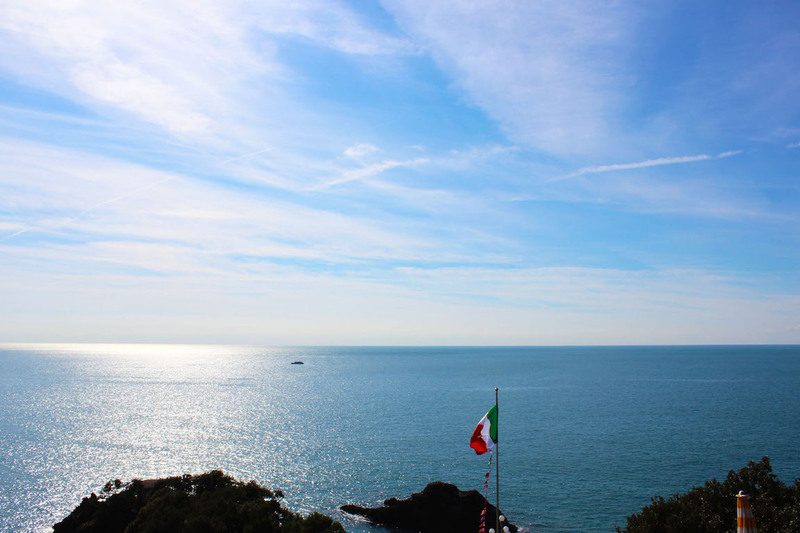 We later discovered that this was Il Gigante, originally constructed as a 14-meter high sculpture of Neptune holding the waves at bay. 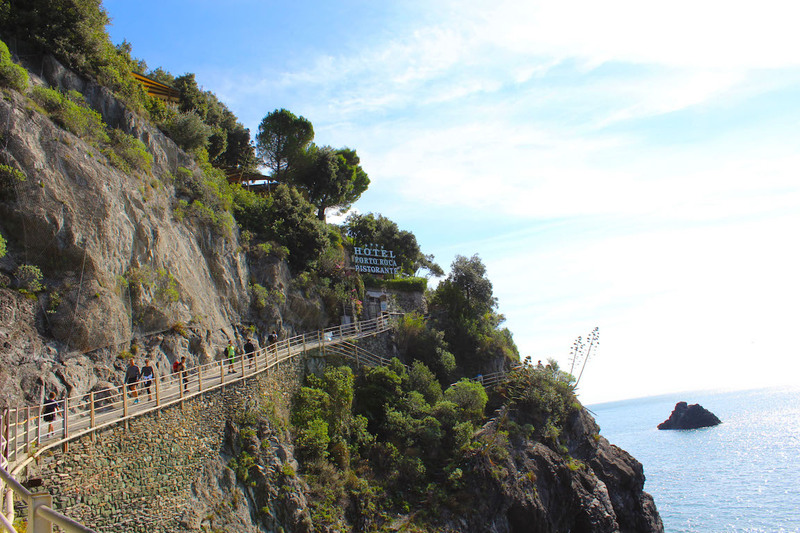 Since his construction in 1910, Il Gigante has had his fair share of trauma. Allied bombings saw the loss of his arms and trident, and rough seas in the 1960’s further deteriorated his physique. 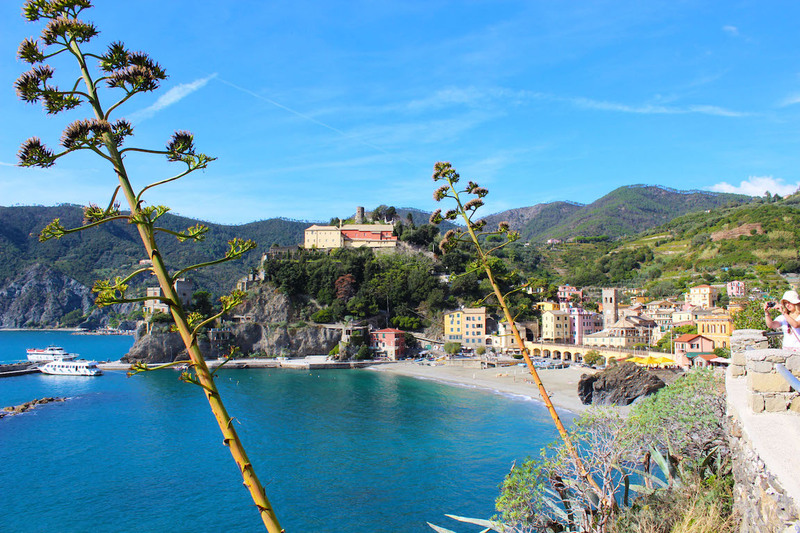 Today, he remains a romanticized symbol of Monterosso al Mare, proudly displaying decades of decayed charm. 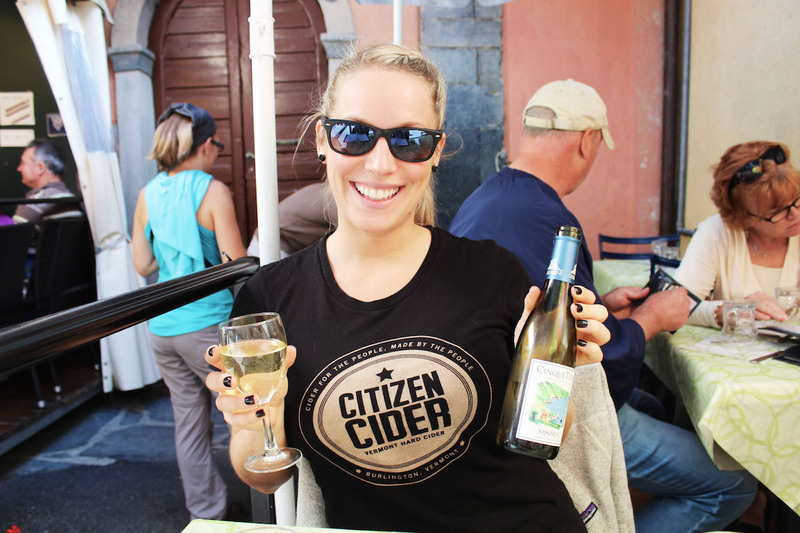 Thank you and you’re welcome :) I’m already plotting how and when I can go back!! I can’t blame you. 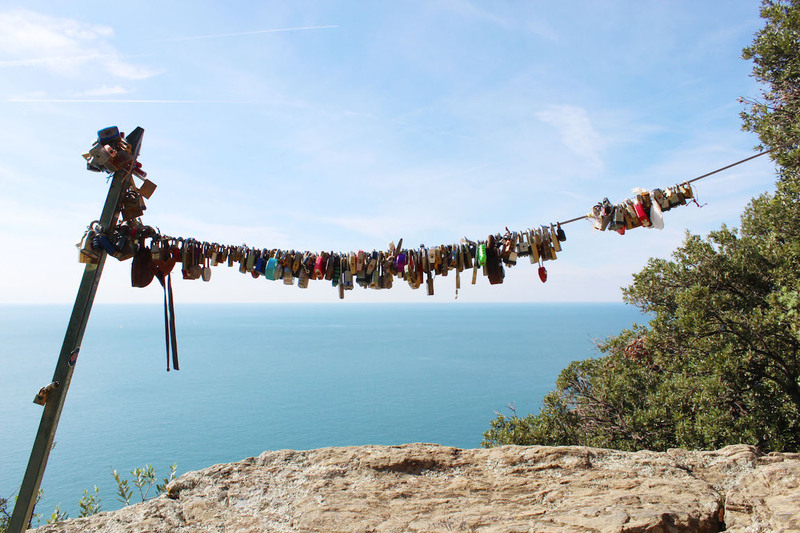 It’s such a beautiful place.